Wednesday Macrh 12th 1890 It was a bright warm day and Will and I went down to Aunt Libs to a dinner party. The roads were very muddy but as it was not cold we did not suffer riding. We had a splendid visit and got home before six oclock. I read in the evening. 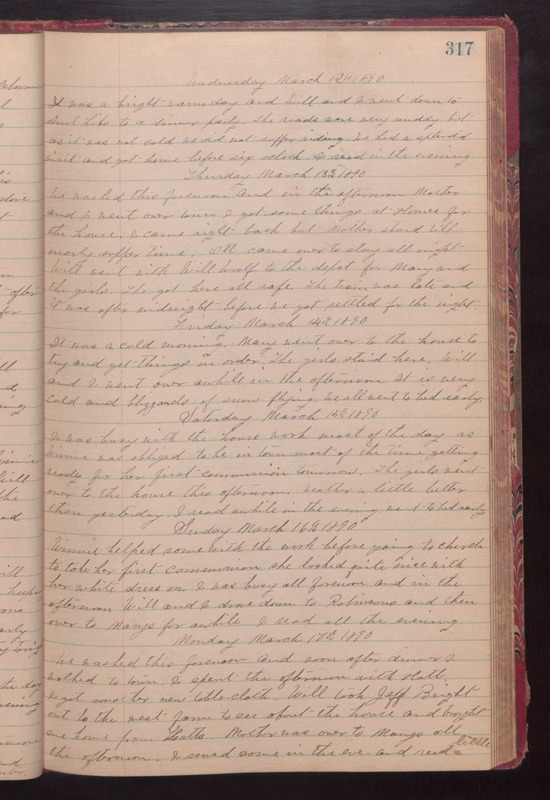 Thursday March 13th 1890 We washed this forenoon and in the afternoon Mother and I went over town. I got some things at Homes for the house. I came right back but Mother staid till nearly supper time. Ott came over to stay all night. Will went with Will Woolf to the depot for Mary and the girls. They got here safe. The train was late and it was after midnight before we got settled for the night. Friday March 14th 1890 It was a cold morning. Mary went over to the hosue to try and get things in order. The girls staid here. Will and I went over awhile in the afternoon. It is very cold and blizzards of snow flying. We all went to bed early. Saturday March 15th 1890 I was busy with the house work most of the day as Winnie was obliged to be in town most of the time getting ready for her first communion tomorrow. The girls went over to the house this afternoon. weather a little better than yesterday. I read awhile in the evening. went to bed early. Sunday March 16th 1890 Winnie helped some with the work before going to church to take her first communion. she looked quite nice with her white dress on. I was busy all forenoon and in the afternoon Will and I drove down to Robinson and then over to Marys for awhile. I read all the evening. Monday March 17th 1890 We washed this forenoon and soon after dinner I walked to town to spend the afternoon with Hatt. I got another new table cloth. Will took Jeff Bright out to the wst farm to see about the house and brought me home from Hatts. Mother was over to Marys all the afternoon. I sewed some in the eve and read a little.